time working in London between 2002 and 2004 that she discovered her love of caring for the elderly, and this compassion is expressed in her interpretation of long-forgotten materials. Upon returning, Roché completed a two-year International Diploma in Interior Architectural Design at Design Time in Cape Town, heading back to London in 2005 for three weeks of practical work experience with South African interior designer Justin van Breda. In the years after graduating, Roché has been involved in the design process for the Cape Royale apartments in Green Point (2006) as well as the refurbishment of the Cape Grace Hotel in the V&A Waterfront (2008). 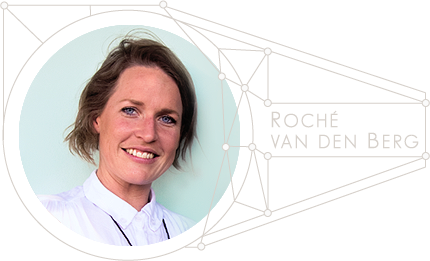 It was in 2006 that Roché was one day drawn to a basket of unwanted inner tubes, and she began up-cycling tyres and creating new uses for the rubber and started her first up cycling business Roche.Recycle.Relove. She has been extremely successful working on a wide range of unique, hand made products and been a part of exciting creative projects with designers such as Marianne Fassler and Charly’s Bakery’s refurbishment of a luxury trailer at the Old Mac Daddy trailer park. In 2011 she did a solo exhibition at 101 Dorp Gallery in Stellenbosch, showcasing her rubber products and art, jewelry, home décor, furniture and sculptures under the label, roche.recylce,relove. Since then Roche has taken part in several local and international exhibitions and trade shows expanding her market and developing her brand. She has featured in the Career Times as well as many magazines and other media like the DeKat T.V show. Roche presented her first workshop for male offenders at the Tswelopele Correctional Facilities in Kimberly in 2013 and it was so succesfull that she has decided to continue with this. metamorphosis forever. Giving new life to the discarded is what drives and inspires Roché van den Berg. Constantly influenced by nature and social moments, she uses texture and the contrast of negative spaces to tell each object’s story of rebirth; her vision being that one can either see the ugly in something that is or one can notice the beauty in what it can become.